L.A.'s premier Chicano blogger EL CHAVO! had this collection of images of the murals at Estrada Courts last week at Metroblogging. 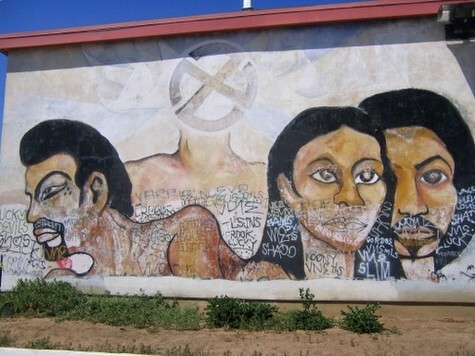 Estrada Courts, territory of the VNE gang, is a housing project in East Los Angeles with some of the most interesting surviving murals from the Chicano Movement, including the groundbreaking "Black & White Mural" by Gronk and Willie Herron III, original members of Asco. Of the work above, CHAVO! says: "I really like this one, even the graffiti seems to blend in nicely. Brown people as subject matter, someone's got to do it." I agree. The layers are themselves windows into the city's history. Link. * ADD: The LA Weekly's web editor Mark Mauer, who has recently launched another LAWeekly.com blog, the street-art focused Lurker, linked to this mural page a couple days after it went up. Another cool post is of fragment images of trash in Los Feliz by Weekly staffer Craig Gaines.